In the last months, I’ve learned a lot about Vue. From building SEO-friendly SPAs to crafting killer blogs or playing with transitions and animations, I’ve experimented with the framework thoroughly. But there’s been a missing piece throughout my learning: plugins. Most folks working with Vue have either comes to rely on plugins as part of their workflow or will certainly cross paths with plugins somewhere down the road. Whatever the case, they’re a great way to leverage existing code without having to constantly write from scratch. Many of you have likely used jQuery and are accustomed to using (or making!) plugins to create anything from carousels and modals to responsive videos and type. We’re basically talking about the same thing here with Vue plugins. So, you want to make one? I’m going to assume you’re nodding your head so we can get our hands dirty together with a step-by-step guide for writing a custom Vue plugin. Plugins aren’t something specific to Vue and — just like jQuery — you’ll find that there’s a wide variety of plugins that do many different things. By definition, they indicate that an interface is provided to allow for extensibility. Brass tax: they’re a way to plug global features into an app and extend them for your use. Add some global methods or properties. Add one or more global assets: directives/filters/transitions etc. Add some component options by global mixin. A library that provides an API of its own, while at the same time injecting some combination of the above. OK, OK. Enough prelude. Let’s write some code! At Spektrum, Snipcart’s mother agency, our designs go through an approval process, as I’m sure is typical at most other shops and companies. We allow a client to comment and make suggestions on designs as they review them so that, ultimately, we get the green light to proceed and build the thing. We generally use InVision for all this. The commenting system is a core component in InVision. 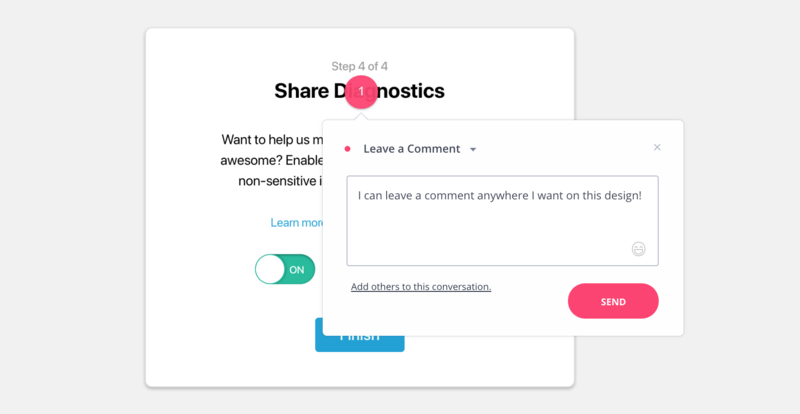 It lets people click on any portion of the design and leave a comment for collaborators directly where that feedback makes sense. It’s pretty rad. As cool as InVision is, I think we can do the same thing ourselves with a little Vue magic and come out with a plugin that anyone can use as well. The good news here is they’re not that intimidating. A basic knowledge of Vue is all you need to start fiddling with plugins right away. This gives us the classic “Hello World” start we need to crank out a test app that will put our plugin to use. A Vue plugin is basically an object with an install function that gets executed whenever the application using it includes it with Vue.use(). Vue.use(CommentsOverlay) // put the plugin to use! We want the plugin to be configurable. This will allow anyone using it in their own app to tweak things up. It also makes our plugin more versatile. One thing you want to avoid with this plugin is having its DOM and styles interfere with the app it is installed on. To minimize the chances of this happening, one way to go is making the plugin live in another root Vue instance, outside of the main app’s component tree. The app lives in a new div at the end of the body. The event handlers defined in the options object are hooked to the matching events on the root instance. This will make sense by the end of the tutorial, promise. The $commentsOverlay property added to Vue’s prototype exposes the root instance to all Vue components in the application. Finally, we need a way for apps using the plugin to tell it which element will have the comments functionality enabled. This is a case for a custom Vue directive. Since plugins have access to the global Vue object, they can define new directives. It adds its target to the root instance’s data. The key defined for it is binding.value. It enables consumers to specify their own ID for target elements, like so : <img v-comments-enabled=”imgFromDb.id” src=”imgFromDb.src” />. It registers a click event handler on the target element that, in turn, emits an event on the root instance for this particular target. We’ll get back to how to handle it later on. The install function is now complete! Now we can move on to the commenting functionality and components to render. What’s this doing? We’ve basically created a wrapper that’s holding another component we’ve yet to make: CommentsOverlay. You can see where that component is being imported in the script and the values that are being requested inside the wrapper template (target and target.id). Note how the target computed property is derived from the root component’s data. Now, the overlay component is where all the magic happens. Let’s get to it! I know, I know. A little daunting. But it’s basically only doing a few key things. First off, the entire first part contained in the <template> tag establishes the markup for a comment popover that will display on the screen with a form to submit a comment. In other words, this is the HTML markup that renders our comments. Next up, we write the scripts that power the way our comments behave. The component receives the full target object as a prop. This is where the comments array and the positioning info is stored. Lastly, the handler for the commentTargetClicked events we saw earlier is managed within the mounted and beforeDestroy hooks. It’s worth noting that the root instance is used as the event bus. Even if this approach is often discouraged, I judged it reasonable in this context since the components aren’t publicly exposed and can be seen as a monolithic unit. Aaaaaaand, we’re all set! After a bit of styling (I won’t expand on my dubious CSS skills), our plugin is ready to take user comments on target elements! We spent the bulk of this post creating a Vue plugin but I want to bring this full circle to the reason we use plugins at all. I’ve compiled a short list of extremely popular Vue plugins to showcase all the wonderful things you gain access to when putting plugins to use. Vue-router – If you’re building single-page applications, you’ll without a doubt need Vue-router. As the official router for Vue, it integrates deeply with its core to accomplish tasks like mapping components and nesting routes. Vuex – Serving as a centralized store for all the components in an application, Vuex is a no-brainer if you wish to build large apps with high maintenance. Vee-validate – When building typical line of business applications, form validation can quickly become unmanageable if not handled with care. Vee-validate takes care of it all in a graceful manner. It uses directives, and it’s built with localization in mind. I’ll limit myself to these plugins, but know that there are many others waiting to help Vue developers, like yourself!